The oil pump lubricates a running engine by supplying it with oil. This lubrication prevents the engine’s metal components from making contact with each other. The oil pump also absorbs heat from the engine’s components while they’re running. Even though the oil pump may seem heavy duty, it can fail over time. It’s important to recognize the signs of when the oil pump is starting to wear out, as this means the engine and its components won’t be lubricated. What really happens when an oil pump fails is that severe engine damage can occur if you don’t replace it right away. Below, we’ll discuss more of the symptoms of a bad oil pump and the estimated costs for replacing it. There are many symptoms to look for when the oil pump goes bad. Some of the common symptoms are: noise from the valve train, strange noises from the hydraulic lifters, reduced oil pressure, a hotter engine, and a noisy oil pump. Usually, the oil pump doesn’t get servicing until it actually starts to fail. Once it does, it’ll quickly damage your engine. Oil pressure is regulated by the oil pump. When the oil pump goes bad, oil pressure will start to decrease while in the engine. Usually, the first sign of decreased oil pressure will be on your dashboard when the low oil pressure warning light turns on. Once this happens, check to see what your oil level is. If it’s too low, add more oil until the oil level is normal again. In the event your oil pressure is still low after this, it means the oil pump is bad. Replace the pump right away before the symptoms get worse. As oil is pumped into the engine, it acts as a lubricant, cooling the engine’s moving metal components. When the engine doesn’t get enough oil, these metal components rub together and produce heat. A warning light on your dashboard to signal that your engine’s temperature is high once enough heat is generated. Once the engine becomes too overheated, it can cause damage to your engine and its components. Since it would cost thousands of dollars to repair this kind of damage, it’s best to get your car to a mechanic right away once the warning light comes on. There are critical components in the valve-train system which enable the engine to keep running. Aside from the hydraulic lifters in the valve-train, it also contains push rods, seals, and valve guides. These components all depend on oil to flow through them so they can be lubricated. When they aren’t properly lubricated due to low oil, these components can seize and stop working altoghether. The valve-train will also produce a lot of noise as the oil levels continue to decrease. 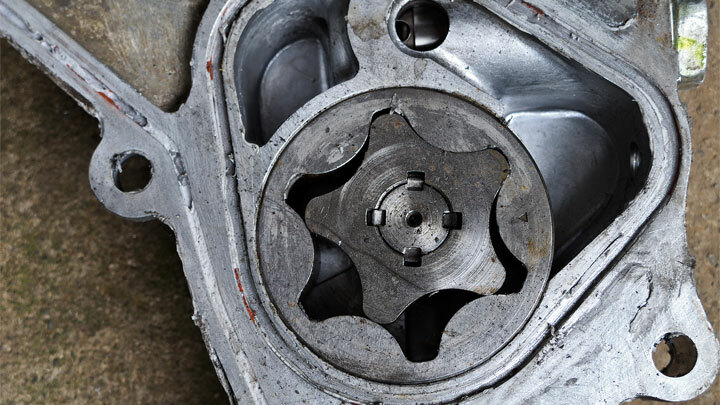 A noisy oil pump is a rare symptom, as oil pumps only make noise when they’re starting to fail. You’ll probably hear a whirring or whining sound when this happens, even when the car is idle. This indicates the oil pump’s internal gears are worn out, meaning you’ll need to replace the entire pump. Hydraulic lifters are crucial for sustaining the functionality of your valve-train. These lifters can only function properly when they are lubricated with enough oil. A faulty oil pump will cause oil pressure to decrease to the point where oil can’t flow into the hydraulic lifters of the engine. This will cause the hydraulic lifters to make noise because they aren’t being properly lubricated. As a result, they will wear out quickly. On some cars, the the type of oil you use has a direct effect on lifter noise. The two main costs you’ll have when replacing an oil pump are the parts cost and then the labor cost for replacing the old pump. You could always install the part yourself to save money, but a mistake could make things much worse. A new oil pump will cost you anywhere from $100 to $300, depending on the make and model of your car. As for labor costs, it will generally run around $200 or $300, since it takes a few hours for the mechanics to complete this type of job. Therefore, the total price you can expect to pay for an oil pump replacement is $300 to $600. The oil pump is made to be durable so it should last you for years. However, like all manufactured car parts, they will eventually wear out with age. That’s why you should pay attention to the oil pressure and heat in your vehicle at all times. Never assume that overheating is caused by the radiator without checking for proof. A noise coming out of your engine is a clear warning sign that the oil pump is in trouble. This noise means that oil isn’t flowing into the engine’s components to lubricate them. Always change your oil pump if you notice these symptoms occurring. oil pump is not fast moving parts. generally when your engine always keep maintenance well and always drive in procedure way, it will take long life span.